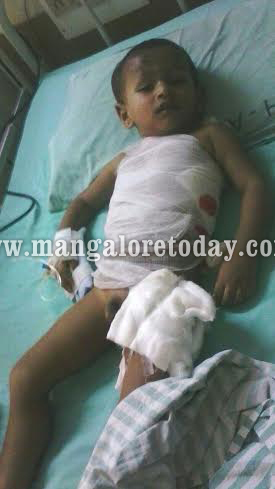 Mangalore, Aug 07, 2014: A two year old child sustained critical injuries after he was attacked by stray dogs at Kudroli in the city on August 7, Thursday. The boy Mohammad Imad, son of Ummar Imtiyaz and Badrunnisa Banu of Kudroli, has been rushed to KMC Hospital at Attavar after initial treatment at Yenepoya Hospital. Sources said he is in a critical state. The incident took place while the boy was playing outside the gate. The family which was having breakfast rushed out on hearing the screams of the child and to their horror saw four to five dogs pouncing on him. One of the relatives of the victim has informed that stray dogs in the area had attacked another child a week ago and charged the local corporator of apathy to the problem. Meanwhile, Corproator Azeez Kudroli has said he has intimated the Mayor and the MCC health Department to take serious note of the stray dog menace in the area.